When you choose Cavitron products, you’re investing in clinical efficacy, ergonomics, ease of use, patient comfort, and long-term reliability. 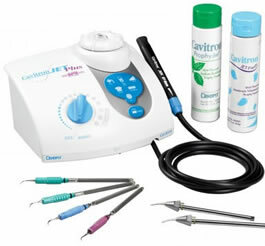 Designed to deliver the best dental hygiene care, the Cavitron® Plus™ ultrasonic scaler and Cavitron® Jet Plus™ are the latest addition to a complete portfolio of quality products. The Cavitron® Plus™ ultrasonic scaler and Cavitron® Jet Plus™ combination ultrasonic scaler and air polishing unit continue to raise the professional standard. The next generation of intelligent ultrasonic scalers, Cavitron® Plus™ combines advanced features of 360 wireless footswitch, illuminated Diagnostic Display, Rinse setting, and automated Purge with our proven SPS Technology to provide the ultimate in ultrasonic scaling. And, add the benefit of superior air polishing with the Cavitron® Jet Plus™ combination unit. The choice is simple. If you want the best, you want Cavitron products. And if you care about your patients – and your practice – choose the best. Core feature on all 30kHz Cavitron units. Exclusive system uses a feedback coil in the Steri-mate handpiece to monitor the inserts harmonic frequency. Automatically drives the insert at its natural harmonic frequency – the point of maximum tip stroke. Automatically adjusts system power to maintain tip stroke compensating for clinical load and conditions. "Cruise control" with finer control of power to deliver perfectly tuned performance every time. Delivers consistent tip stroke while enabling quick insert changes to maximize instrument adaptability. Engineered from the ground up, designed with the needs of the hygienists and practioners in mind. Unique cone-shaped foot control that can be activated from any side (360 activation). Boost power up to 25% (on low end) with a simple downward stroke of the foot control. Safer – Never trip on unit’s cord. Lets you know at a glance that the Cavitron is ready for use. Service light alerts clinician of any setup problem or internal system error. Cut cavitation power with a twist of the blue power level control to flush periodontic pockets and wash away debris. System automatically flushes the lavage for two minutes. Assists in the preparation for next patient with the push of a button. Significantly reduces prep time and ensures fresh lavage for each patient you treat. Allows the user to easily identify the power level most comfortable for sub-gingival scaling. 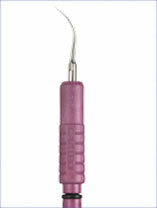 We now offer the same swivel feature in our combination unit that makes our ultrasonic scaler so easy to use! Entire handpiece pivots freely for improved ergonomics, without the expense of rotatable inserts. Easily reach distal surfaces, furcations of the maxillary molars, and other difficult areas by manipulating the handpiece directly, instead of the insert. Fingertip control of the lavage to create proper balance of lavage flow and patient comfort. The Cavitron® SofTip™ Ultrasonic Implant Insert is the latest addition to the large variety of Cavitron Inserts designed for superior access and patient comfort. The Cavitron SofTip Implant Insert removes plaque and calculus around titanium implants and abutments, allowing you to save time during an implant maintenance procedure and providing the convenience of lavage delivery. The Cavitron® SofTip™ Implant Insert is only used with a SofTip™ disposable prophy tip attached. 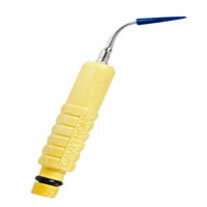 The SofTip™ disposable prophy tip is a single-use, plastic tip that is safe for implant maintenance. DENTSPLY has expanded on the Cavitron reputation for technology leadership and performance with the launch of Cavitron THINsert™. The Cavitron THINsert™ is a great new insert design that will facilitate debridement in areas with limited access.